The Cuisinart EM-100 Espresso Maker prepares coffeehouse-quality espressos, cappuccinos, and lattes. This high-quality machine is designed for home use but has all the accoutrements of the professional versions, with 15 bars of pressure from a high-quality pump that runs at 1000 watts for the right amount of water pressure. The EM-100 has a water tank that holds 53 ounces and can be removed for easy cleaning and filling. Other highlights includes a stainless steel steam wand, removable drip tray and cover, and cup-warming surface on top. The Espresso Maker Inar has many exciting features for users of all types. 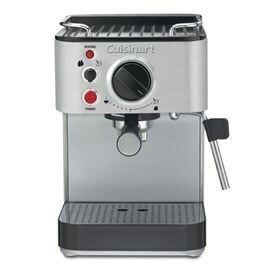 See the Espresso Maker Inar gallery images above for more product views. 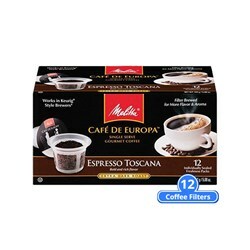 FactoryOutletStore stocks a full line of accessories like Melitta 75752 Espresso Toscana Hard Pod (Single Pack) for the Espresso Maker Inar. The Espresso Maker Inar is sold as a Brand New Unopened Item.